We both started a new Wednesday series on the same Wednesday! Enjoy the magazine. I've noticed that the "parents cover child" competition they run has trended towards ethnically "interesting" (for lack of a better word) kids as finalists the last few years. Lots of kids who are probably racially mixed and whose race you definitely can't identify immediately. 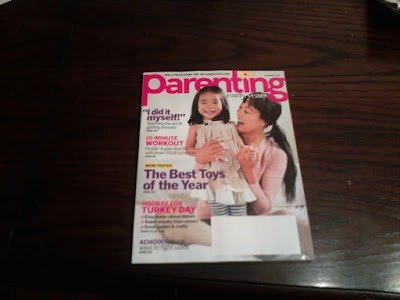 I think Parenthood is pretty conscious about being somewhat racially diverse, but they're all pretty Pottery Barn Suburban. Hey, is this Parenting: early yesrs? My cousin gave me a few copies, and the September issue has a black mother and child on it. Next up, interracial families? ?